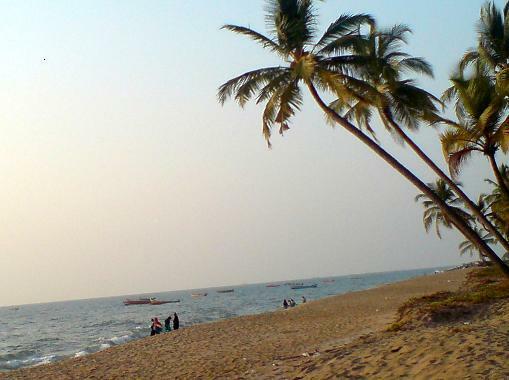 Karwar Beach is just 100 kms away from Goa. This beach is a beautiful spot to enjoy the thrills of sun, sea and sand. It is known for the gentle waves, silver sand and palm fringed beaches. The calm atmosphere and lavish surrounding attract tourists from all over. The great poet Rabindranath Tagore was inspired to write his first play at the beauty of this beach. The Venkataramana temple located here is believed to be 300 years old and exhibits some fine ochre paintings. Dandeli Game Park,located 157 kms away, is a treat for the wildlife lovers. Mouth watering spicy sea food garnished with coconut. The best time to visit and enjoy the beach is between September to May. By rail: The nearest railway station is Karwar. By road: Karwar is well connected with good network of roads.